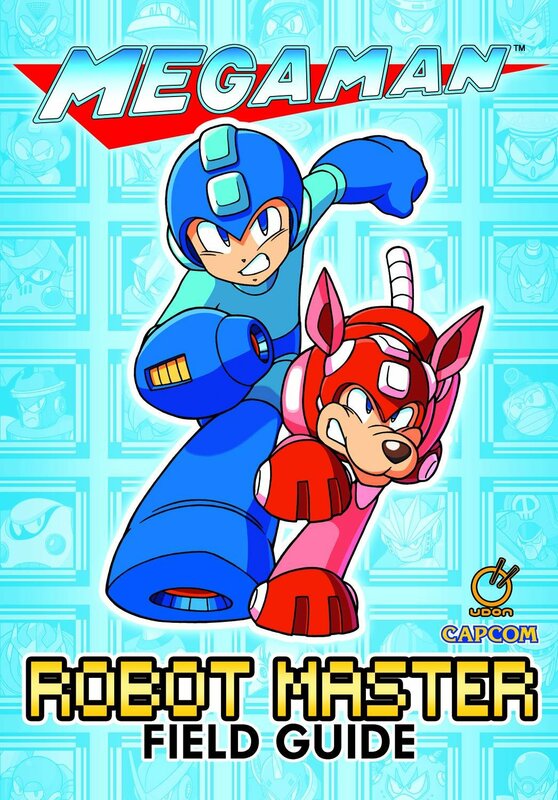 Mega Man Robot Master Field Guide, by David and Nadia Oxford – The Mega Man series is pretty difficult (I could never get much of anywhere in any of them, although I watched my brother win the first seven), but incredibly creative, full of colorful characters and backgrounds. This book presents the main robots in the series alphabetically, each with illustrations including official artwork and game sprites. They also have descriptions that not only detail how they attack within the game, but also give details about their personalities and what (if anything) they did before being consigned into combat. Did you know that Aqua Man likes fart jokes, that Chill Man is a photographer, that Cut Man enjoys kirigami (like origami, but with cutting involved), that Dive Man and Pirate Man don’t get along despite their common nautical themes, that Dust Man has bad breath, that Guts Man likes karaoke and is good friends with Stone Man, that Flame Man requires three oil changes per day, or that Wood Man is interested in sumo wrestling? Robots with strangely old-fashioned designs, like the steam locomotive Charge Man and the propeller-based Gyro Man, are said to have been cost-cutting measures by Dr. Wily. While it makes sense that the Robot Masters would have hobbies, as they were programmed to be human-like (although they apparently don’t have full free will, X being the first robot who does), I’m not sure why they would have been given the ability to consume food. Yet it’s mentioned that Auto enjoys crackers, Frost Man likes rock candy, and Heat Man is fond of barbecues. At least with Tango, it’s mentioned that his craving for tuna is unusual for a robot. I guess that, with the level of technology in the games’ world, they COULD make robots that taste things, but what would be the point? I’m also not sure what Plant Man gets out of sunbathing. 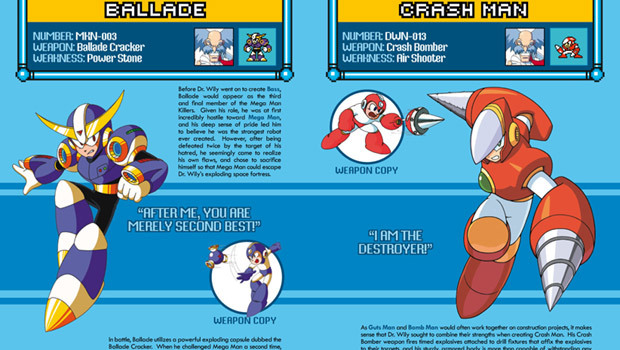 In addition to the primary series, the guide covers bosses from the Game Boy games, Mega Man & Bass, and the bonus stages from The Wily Wars. While most of the Game Boy installments just reuse Robot Masters from the NES games, Mega Man V (the convention became to use Roman numerals for the GB ones, even though I’m pretty sure they were used in some of the NES ones before that) instead features the extraterrestrial Stardroids. The three new Masters from Wily Wars are based on the disciples from Journey to the West, one resembling a monkey with an expanding staff, another pig-like, and a third based on a kappa. I don’t think the third disciple (known as Sha Monk or Sandy in translations) was ever described as a kappa, but he DID live in a river. While not credited on the cover (at least not of the edition I have), the writers have contributed a lot of work related to video games to the Internet. David, for instance, is the main author on the Mega Man Network, as well as poisonmushroom.org and its related Tumblr. This entry was posted in Book Reviews, Chinese, Focus on the Foes, Food, Japanese, Mega Man, Mythology, Video Games and tagged aqua man, auto, buster rod g, charge man, chill man, chu pa-chieh, cut man, david oxford, dive man, dr. albert wily, dust man, flame man, frost man, guts man, gyro man, heat man, hyper storm h, journey to the west, kappa, kirigami, mega man and bass, mega man robot master field guide, mega man the wily wars, mega man v, mega water s, nadia oxford, pirate man, plant man, robot masters, robots, sha monk, stardroids, stone man, sun wukong, tango. Bookmark the permalink.